Thinking of having a weekend break at a European city? Want to know the best places to eat when you're there? Then the 30th edition of the MICHELIN guide Main Cities of Europe might just be what you are wanting. The new 2011 guide was released earlier this year and now features a selection of hotels and restaurants covering all comfort and price categories in 44 cities in 20 European countries to make travelling easier. In all, the MICHELIN guide Main Cities of Europe 2011, which the first guide Main Cities was published in 1982, now features 1,557 hotels (of which 110 new entries) and 1,771 restaurants (199 new). The selection of restaurants includes 239 displaying the Bib Gourmand pictogram, which indicates very good value for money (46 new), 15 awarded three stars, 58 with two stars (of which 6 new) and 284 with one star (39 new), as well as 23 pubs that serve good meals and 34 tapas bars. One recent development is the rapid growth in gourmet restaurants in Budapest, which now has its second one-star establishment – Onyx - as well as 4 awarded the Bib Gourmand label. Confirming that the trend towards greater value for money extends across all countries, the selection includes six new Bib Gourmand restaurants in Copenhagen (for a total of twelve) and two new Bib Gourmand restaurants in Helsinki (for a total of four). Written in English, the MICHELIN guide Main Cities of Europe 2010 targets business travellers and tourists visiting leading European cities who want to be able to easily find a restaurant or hotel that meets their requirements ... for most of us that means value for money. MICHELIN still produce their good old paper guides, of which more than one million copies were released worldwide last year, but to adapt to readers’ changing needs and knowing that many use modern media such as LincsMag to get their information, relax and be entertained, so the selection of the MICHELIN guides is now more widely available than ever: on the Viamichelin.com website (which they claim has more than 400 million visitors a year) for choosing a restaurant when at home, and now via iPhone applications that enable users to find the right restaurant close to where they are. The Europe iPhone application (priced at €14.99) includes restaurants from MICHELIN guides in all European countries, including those covered in the Main Cities of Europe guide. Applications are also available for France, Italy, Germany, Spain & Portugal and the United Kingdom (€7.99 each). For more than a century, the MICHELIN guide collection has made travelling easier by providing a selection of the best restaurants, hotels and guesthouses around the world. Today, the 26 guides in the collection cover 23 countries on three continents and include more than 45,000 addresses worldwide in all comfort and price categories. European cities covered in the MICHELIN guide Main Cities of Europe 2011: Germany (Berlin, Cologne, Frankfurt, Hamburg, Munich, Stuttgart) – Austria (Vienna, Salzburg) – Belgium (Brussels, Antwerp) – Denmark (Copenhagen) – Spain (Madrid, Barcelona, Valencia) – Finland (Helsinki) – France (Paris, Lyon, Strasbourg, Toulouse) – United Kingdom (London, Birmingham, Edinburgh, Glasgow) – Greece (Athens) – Hungary (Budapest) – Italy (Rome, Milan, Turin, Florence) – Ireland (Dublin) – Luxembourg (Luxembourg) – Norway (Oslo) – Netherlands (Amsterdam, Rotterdam, The Hague) – Poland (Krakow, Warsaw) – Portugal (Lisbon) – Czech Republic (Prague) – Sweden (Stockholm, Goteborg) – Switzerland (Bern, Geneva, Zurich). 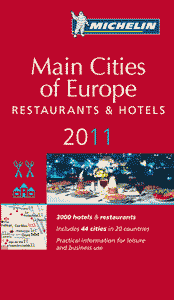 The MICHELIN guide Main Cities of Europe 2011 is on sale in the UK priced at £14.99.